When was the last time a woman sang the exciting OP about ruling the world? Props to Princess Agents for breaking the mold of a fastbeat male opening song and a romantic female ending song. Between this, the Advisors Alliance, and Rush to the Dead Summer, this summer just might make up for the lackluster showing last year. Featuring an ancient drama female lead with an actual goal in mind (and to free the slaves that she was once a part of, no less), and whose romantic deal breaker is politics, this could very well be Zhao Liying’s breakthrough role to launch her out of cutesy roles. OP is by Zhang Bichen and Zhao Liying. This week not only is Zhang Jie back with another pretty theme song, but there are also themes for a string of current/upcoming dramas, including by Momo Wu Mochou, M.I.C., Zhang Bichen, and Tan Weiwei. Last Week’s winner, Zhang Jie’s Sahā World for Monk Comes Down the Mountain. Robynn & Kendy audition for The Voice of China. I know, I know. I was supposed to have this recap up days ago. Just in case we haven’t been paying attention, the beginning of the episode introduces all the judges (again), listing some of their professional accomplishments with short sound bites from them about what they want to achieve. It’s all pretty standard, and none of it is especially remarkable, except for the fact that Chyi Chin doesn’t seem to have aged in 25 years. That’s not to say he doesn’t look his age of 54. Just that he looked 54 back in 1988. Other than that, this episode jumps straight into the first audition. 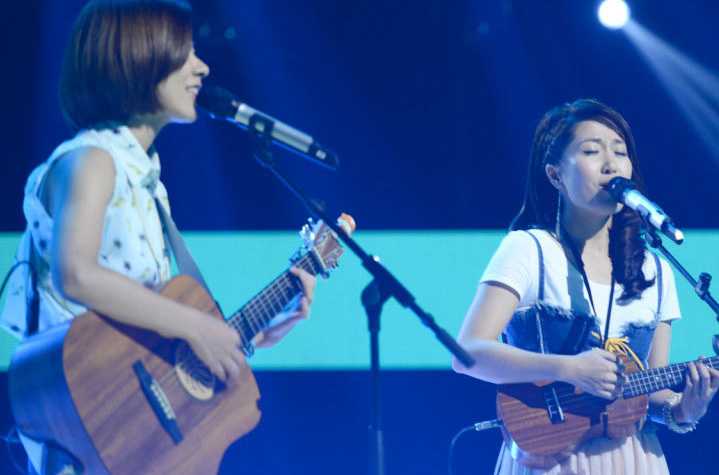 This post is the second in a series of weekly recaps for The Voice of China. Review the first episode here. We jump straight into the first audition. No cute back-story here. What’s up with that? Maybe this contestant is really unlikable and nothing about her is endearing to the audience. The band plays a harder, rockier version of A-mei’s Fire. Oh, our auditionee has a really husky voice. She looks and sounds like chain-smoking lumberjack. I guess this is why they didn’t give her a proper introduction; her speaking voice would have given away the surprise. Her top notes actually resonate really well. “Volcano girl!” Yang Kun replies enthusiastically. “Volcano” in Chinese is literally fire mountain, so Yang Kun just made a pun. It’s not a very good pun. “Her voice sounds like a volcano eruption,” Yang Kun explains to Na Ying. “Her throat is full of fire.” Na Ying says. “Ngraahahaaah,” adds Yang Kun. I don’t know what that’s meant to be. Yang Kun asks if she was born with her voice or if it developed later on.